(May 4, 2018) -- As San Antonio’s multicultural discovery enterprise, UTSA recently held its largest show-and-tell event of the year. Organized by the Office of Undergraduate Research (OUR), the Undergraduate Research & Creative Inquiry Showcase highlights undergraduate student research and creative endeavors from all disciplines. Before and After the "Texas Voter ID Law": How Did SB 14 (82 R Impact Voter Turnout Among Communities of Color During the 2014 Midterm Election? 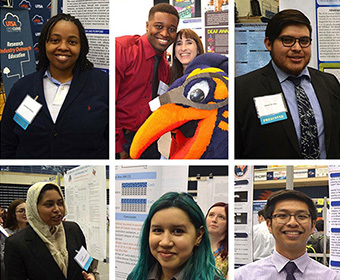 Learn more about the UTSA Office of Undergraduate Research.